Accommodation: Either in 5star or 4star Hotels/Lodges/Camps depending on your budget. Flight Option: Flying option is available for this safari but at an extra cost. Early booking is advised to avoid missing on your choice of hotels/accommodation. Depart from Dar es Salaam city centre by 4×4 safari vehicle to the Selous Game Reserve. Enjoy a late lunch at the Rufiji River Camp. Embark on an afternoon game drive in the reserve, and then return to Rufiji River Camp for dinner and overnight. Enjoy a full day game viewing in the reserve. Participate in some classic – style game drives – exploring the bush in 4 x 4 vehicles. Waterbuck, southern reed buck and bushbuck are common in the Selous. Rare sable antelope, lion and greater kudu also frequent this area. Meals and overnight at Rufiji River Camp. After breakfast, accompany an armed ranger on a waking safari in the reserve. The sights and sounds (and smells) of a walking safari are a special treat that will live long in your memory. The thrill of creeping up to animals to “shoot” them with your camera is a great experience. In the afternoon, enjoy a boat safari where you will explore the different channels and lakes of the Rufiji River System, surrounded by hippos and crocodiles. A large variety of herons, storks, ducks, stilts, and other water birds may be seen. And you also see land mammals, such as giraffe and elephants. Meals and overnight at Rufiji River Camp. Another full day game viewing in the Selous Reserve. Meals and overnight at Rufiji River Camp. Collect picnic lunches and drive to Mikumi National Park and proceed driving to Vuma Hill Tented Camp. The camp is perched above the trees stretching over the seemingly endless wilderness south west of Mikumi National Park. Dinner and overnight at Vuma Hill Tented Camp. After breakfast drive to Ruaha which is famous for its rare sable antelope, roan antelope, and big herds of elephants. The park represents a transition zone where eastern and southern African flora and fauna overlap. Although Ruaha is one of the largest parks in Africa, it is comparatively unknown and, due to its remoteness. Enjoy a late lunch at the lodge followed by an afternoon game drive. Ruaha River Lodge is the only lodge in the reserve and is built on a rocky ridge with spectacular views of the Great Ruaha River. Dinner and overnight at Ruaha River Lodge. Enjoy a full day game drive in the park. Nearly 500 bird species have been sighted within the park. The river area features large numbers of hippo and crocodile and attracts lion, leopard, hunting dog, waterbuck, impala, giraffe, warthog and eland. Grants gazelle, ostrich and cheetah may be seen on the plains. Meals and overnight at Ruaha River Lodge. After an early breakfast drive to Mikumi National Park. Lunch at Vuma Hill Tented Camp, followed by an evening game drive in Mikumi National Park. The park is well known for its population of elephants, giraffes, buffaloes, zebras, elands, and greater Kudu, wildebeest, roan and sable antelope. Predators include tree-climbing lions, leopards, wild hunting dogs and black-backed jackal. You may also see crocodiles, monitor lizards, yellow baboon and hippos. Dinner and overnight at Vuma Hill Tented Lodge. After breakfast, enjoy another game drive in Mikumi National Park. Return to the camp for lunch and then depart for your return to Dar es Salaam. Drop off in the city centre. Transportation in 4×4 Landcruiser Safari vehicle: 8seater or 6seater. 8Seater Vehicle has 6 window seats: 5at the back and 1 in front next to driver. 6Seater Vehicle has 5window seats: 4at the back and 1 in front next to driver. Services of our Tours staff. Tourism Development Levy US $ 1.50 per person per night. All International Flights/local Flights + departure Taxes. Visa fees, Inoculations and personal insurance. Travel & Personal accident insurance and Baggage Insurance. Excursions/services/activities not mentioned in this program. 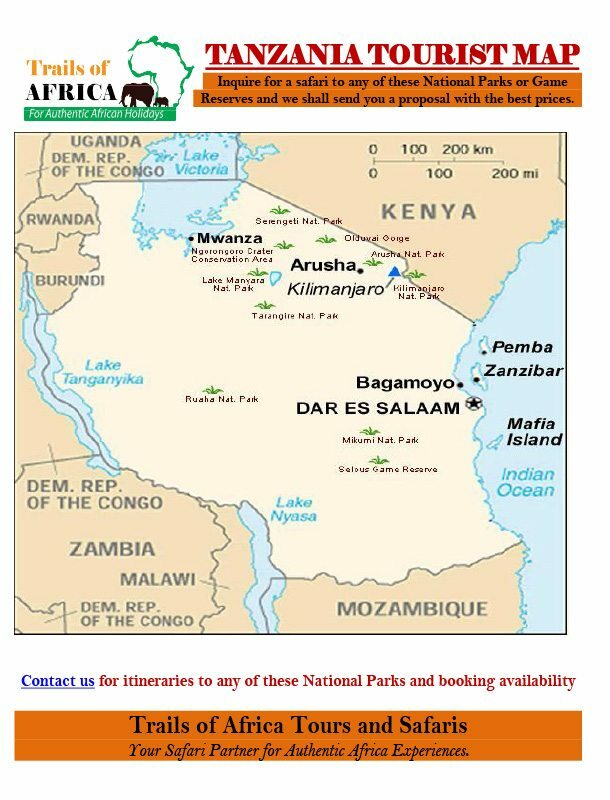 Flying option available for certain safaris at an extra cost. Personal expenses e.g. laundry, telephone calls, Drinks, Tips etc. Xmas and Easter Holiday Surcharge: quoted separately.